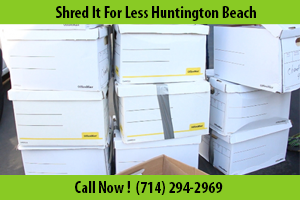 Residents and businesses of Huntington Beach will be happy to know that Shred It For Less is now available to take the hassle out of the important but mind numbing and time consuming task of Paper Shredding. Offering a variety of options for businesses, individuals, and private organizations, our business has a solution that will meet your needs and your budget. Whether you’re an individual just looking to make sure that criminals don’t gain access to things like credit card offers, a business that can’t afford to risk throwing proprietary information in the garbage, or a private organization like a church that has to destroy the personal information of its donors, our business can service clients with any variety of needs. Most of those who don’t have large volumes of documents that need to be destroyed will employ our Drop Shred service. For maximum peace of mind, watch our paper shredding services at work so that you can go about your day confident that your private information won’t fall into the wrong hands. While most people think primarily in terms of financial information, medical records, documents relating to divorce, family photos or diaries can also contain information that you want to be sure nobody else sees. Our paper shredding service will put you at ease. If you’re in a hurry, you may prefer to leave your name and address so that we can send you a Certificate of Destruction, a physical reminder – and proof, if necessary – that nobody will be able to gain access to the sensitive information from the papers you left with us. While Drop Off Shredding Services is a great option for those who have documents that can be conveniently brought to our location whenever someone is in the neighborhood, those who have reams ready for paper shredding, such as businesses and some private organizations, may prefer to schedule an appointment with one of our mobile units. Simply give us a call to let us know when it would be convenient for us to come to your facility and take care of all of your Paper Shredding needs. Not only is this convenient insofar as it prevents having to send a member of your staff to our facility, perhaps several times, to get rid of all of your proprietary information, it also provides the added security of not having sensitive documents leave your facility intact. The employers most concerned about privacy will even be able to watch while our mobile shredding unit destroys the documents in front of their eyes, a luxury they would never have if it required watching someone shred paper with a document shredder for hours on end. Paper Shredding has never been more important than it is today, and fortunately for those in the Huntington Beach area, it’s never been easier, either. Call us today to learn more about how we can meet your document destruction needs, or simply drop by our facility to see our document shredder securely destroy your documents.